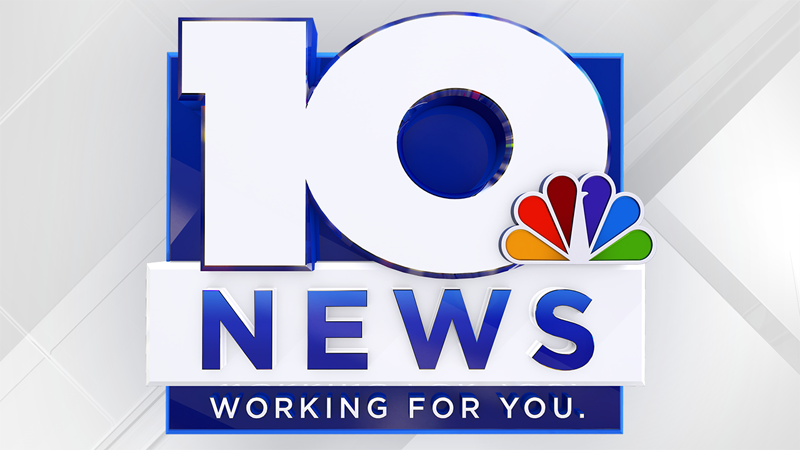 ROANOKE, Va. - So far Sunday, the air has been too dry for any precipitation. 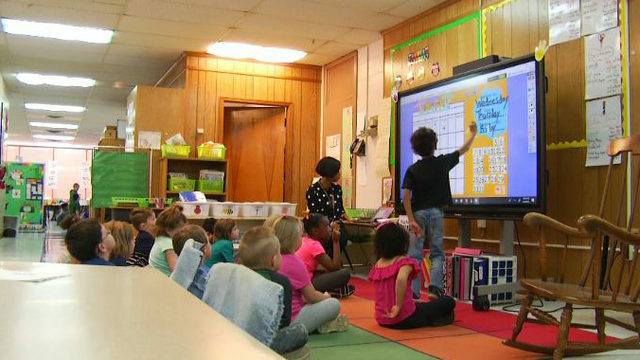 This is something we mentioned on air and online Saturday evening. 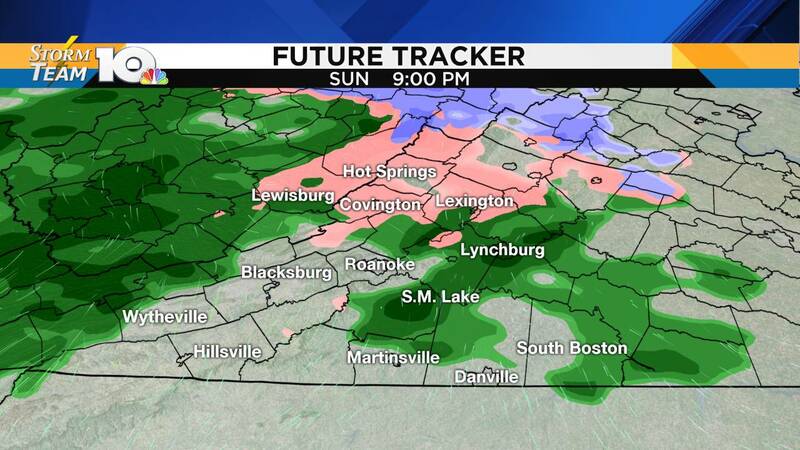 This, in turn, means that any precipitation we see will start mainly after 7 p.m. Sunday. Because the air is dry, evaporation will lead to further cooling at the ground level. That's why we think some pockets of freezing rain and/or sleet will be possible. 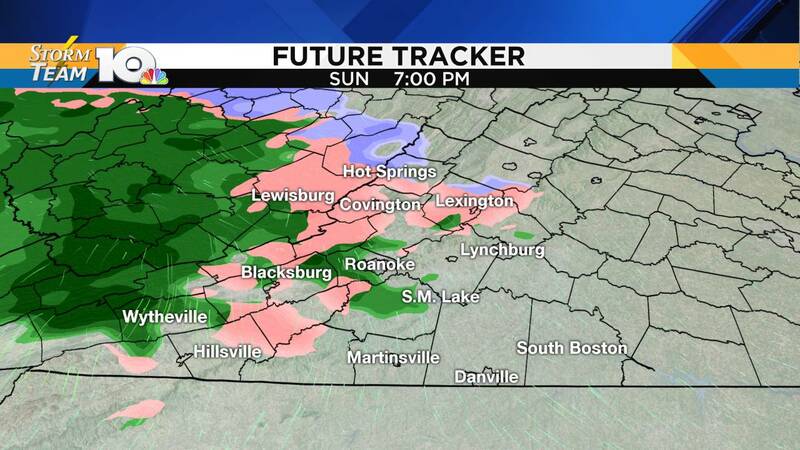 The National Weather Service in Blacksburg has issued a Winter Weather Advisory for areas that have the chance to see a wintry mix Sunday evening. Due to the dry air at the surface, any precipitation will wait until likely after 6 or 7 p.m. before starting in parts of the NRV and Roanoke Valley. 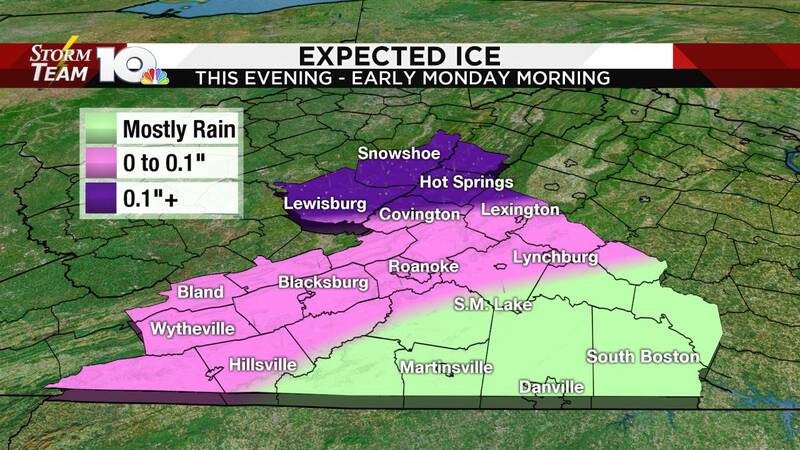 A difference of 1° will determine whether or not you see freezing rain or just a cold rain. The better chance for accumulating ice is north of Highway 460, where the air has been colder throughout the day Sunday. Because of the fact that 1° can make all the difference, we have places from Hillsville and Galax to Pulaski and Blacksburg to Roanoke and Lynchburg in the 0 to a tenth of an inch range. If the temperature stays at 33 or 34°, then no ice will accumulate. However, spots that see a drop toward 31 or 32° may see a light coating of ice on windshields, hand rails, power lines, sidewalks, etc. The best chance for accumulations of a tenth of an inch will be in places from Lexington north. 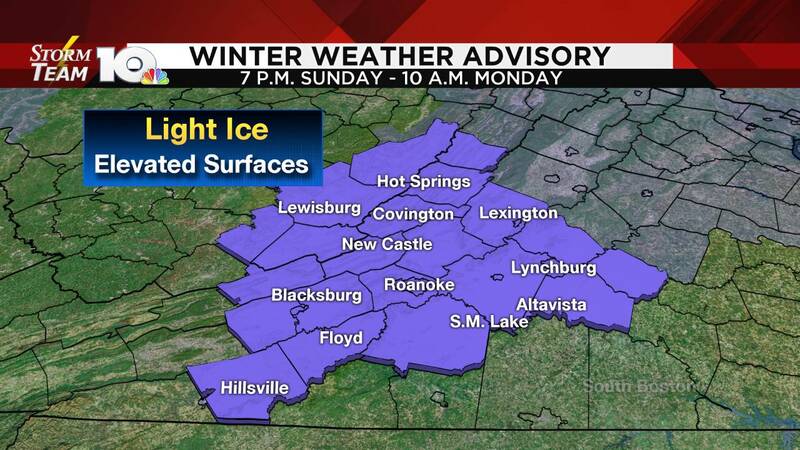 This includes the Highlands from Low Moor and Clifton Forge to Bath and Highland Counties. Road temperatures are "warm" for this time of year, meaning that any frozen precipitation likely won't lead to any major road concerns on the main roads. 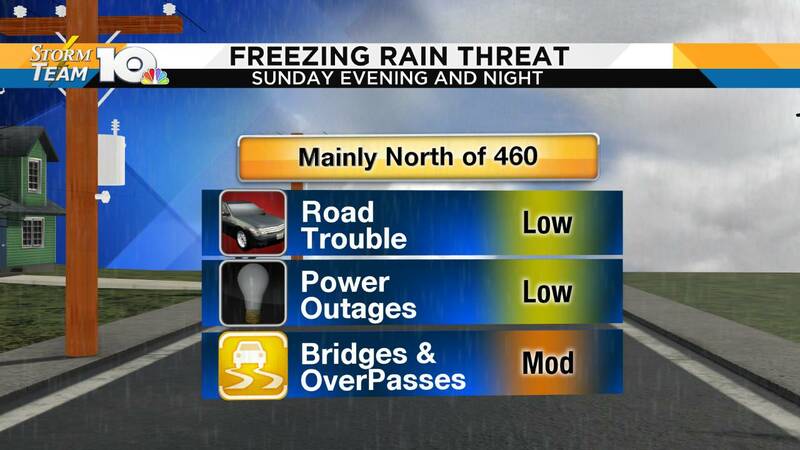 Some icy spots, however, may develop on bridges, overpasses and/or side roads. Be sure to check here for road conditions. Power outages typically only happen if a quarter of an inch of ice accumulates, which would be sporadic at best. Monday looks cloudy and cool, with only a few passing rain showers. 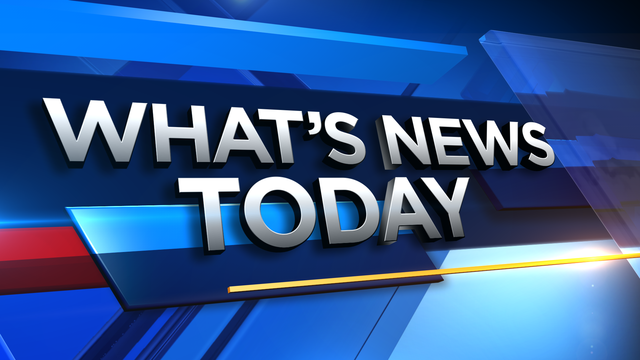 Temperatures will hang in the 40s throughout the afternoon. 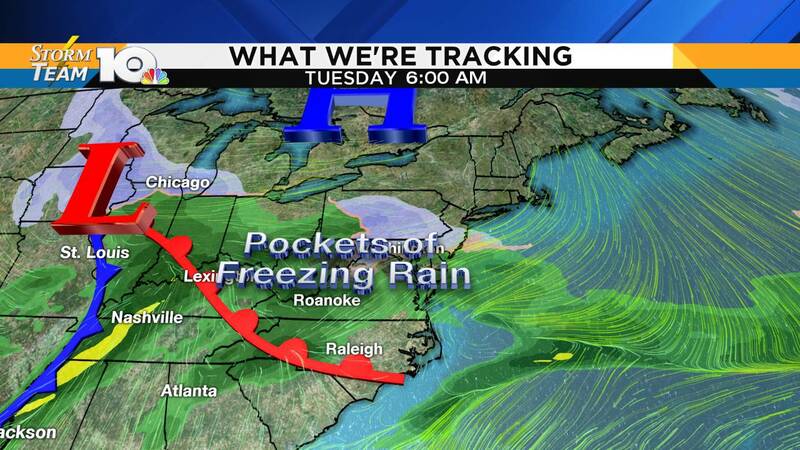 Come Tuesday, a slip of colder air may turn things over to patchy freezing rain again. The better chance of that would be west of the Parkway during the morning. By Tuesday afternoon, we're all rain. Some mountain snow may wrap up Tuesday night into Wednesday morning, before the winds crank up Wednesday morning and afternoon. Thankfully, we're calm for Valentine's Day before our next push of rain this coming Friday.